Just as a fisherman cannot catch fish unless his line is in the water, a wildlife photographer cannot shoot great wildlife images unless he or she is out there with camera in hand and the knowledge of what to do when the "magnificent moment" occurs. The life of the wildlife photographer is not as glamorous as one might expect. The successful photographers often endure all manner of discomforts in pursuit of their art, ranging from disease-carrying insect stings and the bites and maulings and gorings of their subjects to falling out of trees, of cliffs, and into oceans. And, it is very hard work, and often lonely. In other words, wildlife pictures don't just happen, they are made. My passion for nature began when I started rock climbing in the Belgian Ardennes, more than 30 years ago. Spending lots of time outdoors, I became interested in wildlife. Many years later, two other passions came into my life: photography and travel. In 2000, I combined all three to start a career as a part-time climbing instructor and a part-time freelance nature photographer. Today, I spent my time traveling all over the world, from the Alaskan tundra and Costa Rican cloud forests to the Kalahari and Sonoran deserts. My work is published worldwide in books, magazines and calendars and is represented by agencies in Belgium, the Netherlands, UK, France, Spain, India and America. In 2007, I started my own agency - Arterra Picture Library - which represents the work of several Belgian, Dutch and German photographers. 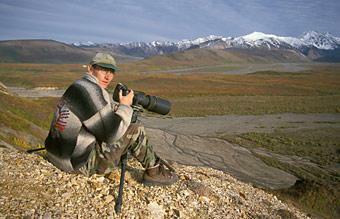 Wildlife photographers spend a lot of time in the field, preparing to take pictures. We scout locations, approach many animals that either run or fly away, out of camera range, and often we sit for long hours in photographic blinds waiting, waiting, waiting, and ...waiting. I can't count the times people have told me, "You must have a lot of patience".